According to a recent story on CNN Money, the unemployment rate for college grads is down to five percent. This is an improvement over the seven percent unemployment rate seen in 2011, and it still beats the national average. However, just because college graduates can get jobs a little easier than they could three or four years ago doesn’t mean that these grads are doing better financially. In fact, many college grads are underemployed, meaning that they are doing jobs that they don’t actually need degrees to do. 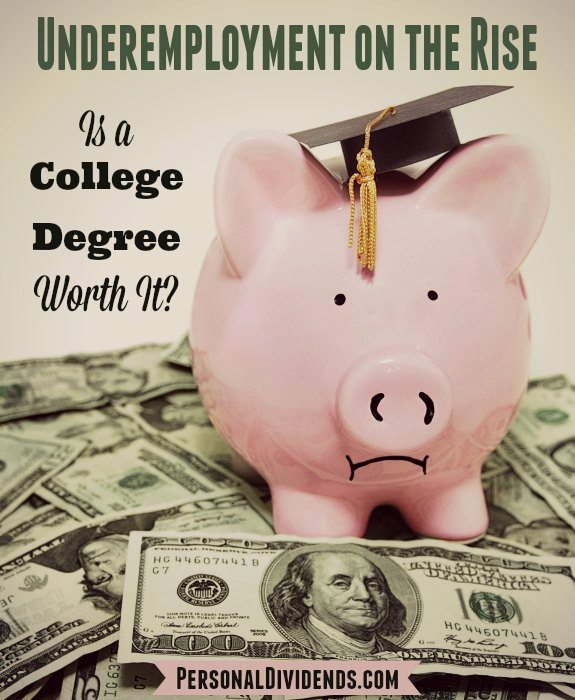 So, is a college degree worth it? Underemployment happens when you work a job that is “below” your skill level. This also means that there is a good chance that the job is also below what someone with your skills, education, and expertise might expect to make in other circumstances. Basically, you’re underemployed if you’re working as a cashier at a retail store when you have a four-year degree. Indeed, while unemployment is relatively low for college grads, the underemployment rate, according to CNN Money, is at right around 46 percent. That means that almost half of recent college grads are working jobs that aren’t going to pay them enough to live on and pay off their massive student loan debt. The same Federal Reserve report cited by the CNN Money story also takes a look at the growth in jobs that don’t require a college degree. They are on the rise in a way that jobs requiring a college degree are not. Some worry that this could have an impact on the ability of graduates to repay their debt — and many think that there are issues with whether or not college is still worth it, considering the fact that many grads are underemployed and have crushing student debt. Even so, the Federal Reserve insists that a college degree is still worth it. The value of a four-year college degree, reports CNN Money, is still, on average $275,000. Taking longer to complete your bachelor’s degree can cause problems, though. The research indicates that you lose $85,000 in lifetime earnings by taking an extra year to finish. Of course, the Federal Reserve report doesn’t take into account the fact that many students have to take out loans to make college happen. And it doesn’t seem to matter to them that it takes about 10 years to recoup the cost of a four-year degree. So, the Federal Reserve thinks that it’s still worth it to get a four-year college degree. But is it really? That depends on your situation, and what you are trying to accomplish. If you go to an elite school and spend more than $100,000 on your degree, and you can only get a job that pays you $35,000 to start, you could be in trouble. Another consideration is what field you choose. Areas of emphasis in science, technology, engineering, and math (STEM) have the potential to pay you better. Indeed, it’s possible to get a good job with a bachelor’s degree in those fields. For many of the social sciences and arts, you need to go on to get an advanced degree in order to qualify for a better job. That means more money spent on schooling — and you may not even get a high-paying job after you finish. It makes sense to take a step back and consider your education options before you decide that a “traditional” four-year degree is the way to go. Instead, consider how you can improve your fortunes by developing a marketable, and in-demand skill, rather than focusing on just getting a piece of paper. The situation has changed, and just having a degree in anything is no longer a guarantee of a good job. I think underemployment is a great argument that colleges should be better preparing their students. College is expensive! To me it seems like it just makes sense to have some more education about finance and finding jobs.